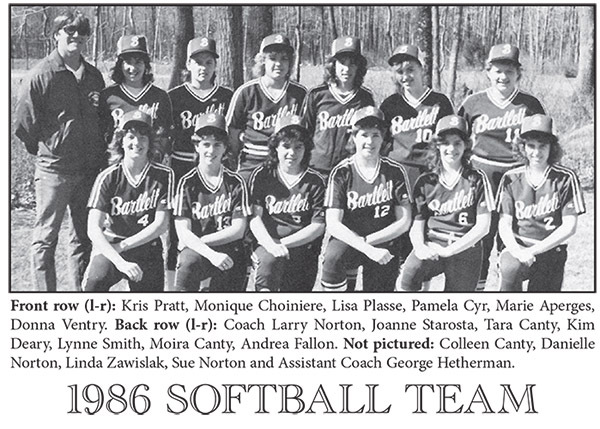 In the spring of 1986 the Bartlett Softball program reached an all-time high and completed an historic season by capturing the school's first District Tournament title in the sport. The team, which finished with an overall record of 16-5, was coached by Larry Norton and Assistant Coach George Hetherman and lead by Senior Captains Colleen Canty and Lisa Plasse. The team's success was fueled by a combination of strong coaching, talent, determination, and a unique level of camaraderie and friendship. Most of the team's members had been playing together since the age of 8 years old in the town's Lassie League. They played with great pride and unselfishness. Each individual did whatever was asked of them with the highest level of effort and trust in one another. After reaching the District Tournament in the previous two seasons but bowing out in first round losses, the girls were determined to return to the playoffs and overcome their opening round struggles. With a focus on fundamentals, strong fielding, and intelligent base-running coupled with the strong pitching of Bartlett Hall of Fame members Danielle Norton and Lynne Silk this special group of girls would finish the regular season with 13 wins and only 4 losses. This effort was good enough to seed them third in the tournament. The opening round game pitted the team against sixth seeded Monty Tech. A strong overall offensive performance and solid pitching propelled Bartlett to a decisive 10-3 victory. This set the stage for a matchup with second seeded Oxford High School for the semi-finals. The Indians offense would stay hot and their defense would work out of two bases loaded situations early in the game to avenge a regular season loss with a 10-3 upset victory to move on to the District Finals. In the Finals, Bartlett would face defending champions and top seeded Quabbin Regional High School. Early offense and heady defense would be the keys to victory again for the team. A 3-run first inning spotted Bartlett with a lead, but when Quabbin loaded the bases with no outs in the bottom of the seventh inning and the score 4-1, it would take a heads up tag and throw double play by second basemen, Hall of Fame Member, Tara Canty and a caught line drive by shortstop Monique Choiniere to preserve the 4-2 victory crowning Bartlett as District Champions for the first time in the programs history. The team ended their season with an impressive 16-5 record, having made it to the State Semi-Finals for the first time in the program's history.